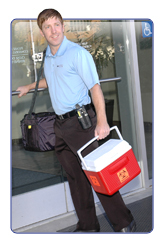 UMC is a logistics company providing service to hospitals, medical organizations and laboratories in Northern and Central California. We serve the healthcare community exclusively and understand the time critical nature of patient healthcare and proper specimen handling. In addition to our menu of services, UMC offers a competitive and flexible pricing structure to help improve your bottom line. Employing an integrated software package that allows for barcode scanning and real-time GPS tracking, UMC clients have the ability to conveniently schedule a pick up from their own computer. Furthermore, we have developed a temperature monitoring system to ensure the integrity of our clients’ specimens. We offer customized transportation solutions ranging from STAT, same day pick ups and deliveries, to full shift coverage. Call our toll free number to speak with a friendly customer service representative. login and schedule a pickup. Enter your tracking number and see exactly where your order is. For further information about UMC, please view our complete pdf brochure here. If you would like to learn more about University Medical Couriers please call us toll free at 1 (877) 770-7714, or contact us by email at customerservice@umcouriers.com. For information about available jobs at UMC please email jobs@umcouriers.com. Copyright © 2010 University Medial Couriers, PO Box 1557, Los Gatos, CA 95031-1557.